Hi friends, welcome back to another blog post! 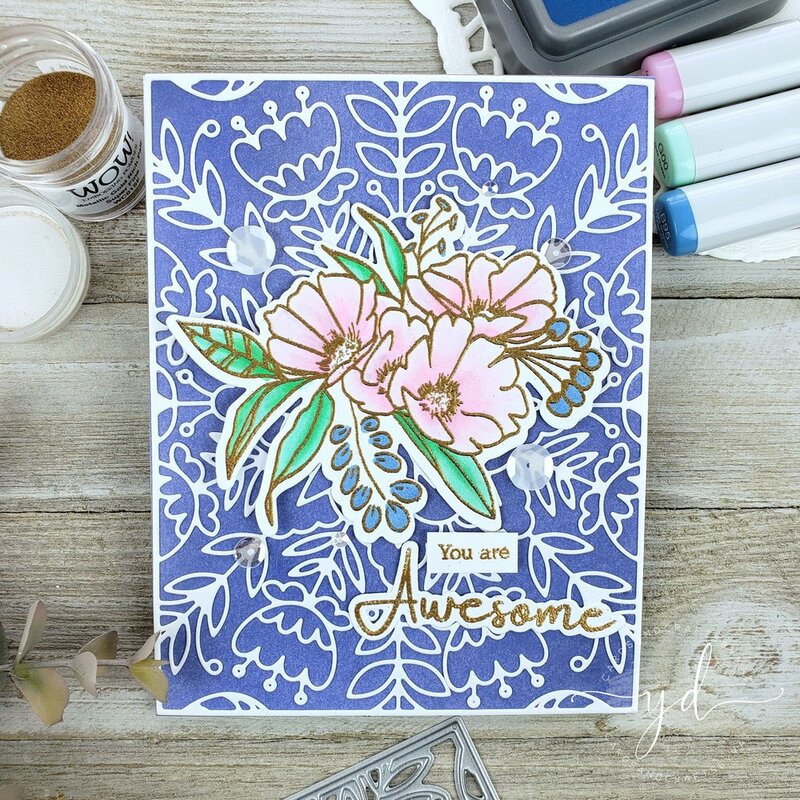 As Spring is around the corner on today’s blog I’ll be sharing with you, 2 uplifting floral cards featuring the Fancy Blooms stamp & coordinated die by Pinkfresh Studio inspired by their March Floral Challenge. So without further ado let’s jump into the blog. For both card panel I started by inking it up a piece of Bristol Smooth card stock with Chipped Sapphire distress oxide ink. However, for the first example I used the solid ink blended background, and for the second I used a cover die as you’ll see down below in the next example. After the ink blending was done I used the Folklore die which I ran through the die cutting machine twice, 1 to die cut out of white card stock, and the second time to die cut it out of the ink blended background. Once the die die cutting was done I adhered one to the inked background, and the other to a white card panel and I set them aside. For the florals I stamped first then I gold heat embossed 2 of the floral images from the Fancy Bloom stamp set which you’ll see in a moment. But in order to achieve that a must thing to do is to use a stamping tool, as you’ll need to reposition the stamping for the heat embossing. So for the coloring I used alcohol markers in the following colors: RV000, RV00, RV02 to color the flowers. G00, G02 to color the leaves, and B95, B97, B97 to color the buds for a contrast. Once I was done coloring I went back to the stamping tool as I mentioned, because I didn’t move the stamps from the stamping tool I was able to reposition them to stamp them once again with a clear embossing ink to gold embossing them. Shortly after the heat embossing was done I ran them through the die cutting machine alone with their coordinated dies, and once the die cutting was done I adhered them in the center to each of the card panels as you can see in the pictures. Last but certainly not least, I used the Lush Greenery stamp & coordinated dies to create the sentiments for the cards. For the one with the solid inked background I gold heat embossed the sentiments, and for the one with the white I used the Chipped Sapphire distress oxide color ink to stamped the sentiments. To finish these cards off I adhered pink pearls for the center of the flowers in one of the cards, and a mix of sequins which I adhered them here and there. Yay, I hope you’ve had a great time here with me, as always I appreciate the time you take to read my blog posts. Down below you’ll find the supply list for all the products used in this post, just as a referral from where they were purchased from. ‒ Here are the links for both websites weather you’re a US or UK user. I am creating this blog with the purpose of sharing how I design my cards, the information provided here is base in my own opinion and creativity. I am not an expert by any means, and I only share the way that I design my cards. All of the products used for this blog post were personally purchased by me. And all of the referral links were added for you to know from where I purchased the items from. The products shared, and mentioned in my blog posts are simply because… I use, and truly love them.